FilConn has developed a unique side mount connector receptacle design. 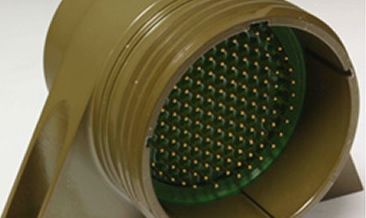 The photo below shows a size 25 38999 Series III connector with the side mount technology incorporated. This mounting design was developed in concert with several customers who had a need for a connector but did not have the luxury of a bulkhead panel to provide the typical flange or jam nut mounting. This application can be developed as a connector adapter with a receptacle interface on one end and a plug interface on the other. FilConn can also provide a receptacle interface and solder cup terminations for typical wire harness attachment. The mil spec compliant mating interface can be tailored to the customers needs with any shell size and insert arrangement required. Also, FilConn's standard filtering and TVS protection can be applied to this product as well. FilConn continues to be the leader in custom connector product design and filter technology. If you have a unique requirement contact FilConn today at 480-222-3565 and speak with an engineer.